that offers the best sound quality and speech intelligibility and can easily be integrated. TeamConnect Wireless conference system with on-board echo cancellation brought greater speech intelligibility into remote meetings. The portable system perfectly meets the constantly changing needs and wide variety of applications in Phillips offices around the world. "TeamConnect Wireless is head and shoulders above anything we had used before. It shows that going to a leading manufacturer of professional microphones means you get a quality way beyond that available from current ‘consumer’ products"
Easy ‘plug-n-play’ set-up, multiple connectivity options, portability, BYOD flexibility and uncompromised audio quality make TeamConnect Wireless shine at the Phillips Auction House. Profile Headquartered in London and New York, with offices throughout the world, Phillips conducts sales in a select number of categories: Contemporary Art, Photographs, Editions, Design, Watches and Jewelry. Phillips Auction House was established in 1796 in London and is renowned as a destination for international collectors to buy and sell the world’s most important contemporary works of art. The company has its European Headquarters in central London and was experiencing significant audio problems with its transatlantic video conferences. There was a terrible echo on the line, as well as intermittent breakups and delay, all of which were exacerbated if anyone joined the conference using a mobile phone. Audio installation specialist SSE Audio Group was brought in to find a viable solution to these issues and recommended Sennheiser’s TeamConnect Wireless as the solution. Emma advised Philips that the first step was to install some acoustic treatment. The next step was to install a much higher quality audio conferencing solution. She suggested that Sennheiser’s all-in-one TeamConnect Wireless system would be a perfect solution for them based on its ease of set up, best possible speech intelligibility, immersive sound quality, the ability to simply plug-n-play with any smart device. Additionally, its global availability would allow it to be installed in any of Phillips’ other locations. TeamConnect Wireless is the first portable wireless conferencing system for online meetings. Its award winning design delivers unmatched ease-of-use, multiple connectivity options, fast setup and high audio quality in a portable system. The turnkey audio solution is exceptionally easy to use and can be set up in less than a minute, so any user can instantly host a professional-sounding online meeting for up to 24 people anywhere. The system supports all Unified Communications requirements for online meetings and offers multiple connectivity options, so that users can quickly connect with any laptop or smart device - wirelessly via NFC enabled Bluetooth or via USB/3.5mm jack wired connections. The system brings a new level of usability to conferencing that makes it easy for anyone to operate with minimal instruction, freeing users from the need for technical support: once out of the case, the four units automatically power up and link together; the intuitive, touch-sensitive control panel on the master unit allows connection to devices and control calls; while the satellite units have touch controls for muting or adjusting volume. Uniquely, TeamConnect Wireless supports multiple simultaneous audio channels, so additional callers can be joined to an existing conference by just connecting another device. Emma set up an initial demonstation of TeamConnect Wireless with Phillips’ UK team to prove that echo cancellation and audio quality were their main obstacles. 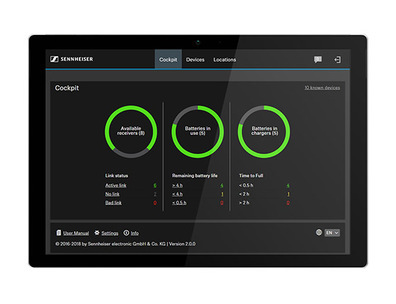 Instantly, the TeamConnect Wireless system proved those two points perfectly. 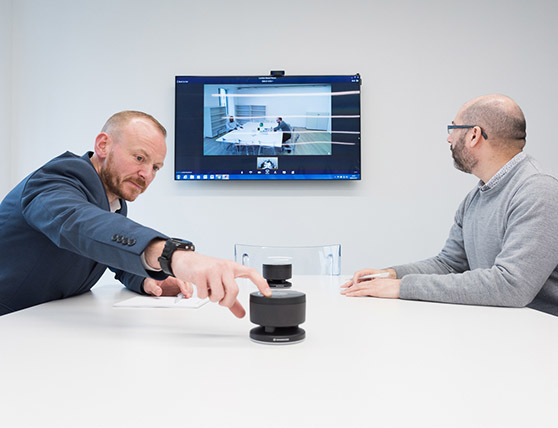 After that, SSE and Phillips organised for Sennheiser US to supply a system to the New York office and set up a video conference with both sides using TeamConnect Wireless. The results were outstanding and the New York stakeholder was impressed. “One of our biggest challenges is the size and breadth of the organization,” says Ben Hinton Phillips’ IT Director UK, Europe & Asia. “We have numerous teams operating across different departments and territories and consistent communication between them is essential to the smooth running of the operation. We need solutions that are easy to implement globally, so that every time zone has a consistent experience and can concentrate on being productive, not managing their AV. Emma notes that Sennheiser went to great lengths to make the equipment available in both the UK and the US. “SSE has a longstanding relationship with the manufacturer, having used many of its microphone products in both the systems it hires out for events and concert touring, and for fixed installations,” she says. “Without Sennheiser’s whole-hearted cooperation, it would not have been possible to engage all the key stakeholders in the project. The company made a demonstration system available to us on two occasions, providing the same system and a representative to demonstrate it in New York. Delivery was also expedited quickly and efficiently. “TeamConnect Wireless is head and shoulders above anything we had used before,” concludes Ben. “It just goes to show that going to a leading manufacturer of professional microphones means you get a quality way beyond that available from current ‘consumer’ products. “We are extremely happy, to such an extent that we bought two more TeamConnect Wireless systems for London and New York and a further four of Sennheiser’s SP20 portable speakerphones for smaller meetings."